This time last year, we were frantically preparing to leave our life in the UK to embrace our new life in Congo. I had never been to Congo before. All I had to go on was what Henri experienced during his 4-day-visit in 2010. Usually, what I find hard, Henri finds easy; and what I find very hard, Henri finds okay. So when he came back from his ‘scouting visit’, shook his head and said that life in Impfondo, Congo was going to be very very hard, I thought, ‘Living there is going to be impossible!’ We wanted to go to Congo because their need for eye care was desperate. We wanted to go because we knew that we could restore sight and change lives. The bottom line for us though was that God called us and we were going to go, whatever we find, be it hard or seemingly impossible, no matter what. While I never put it into words, I had expected a radical change in our financial situation. I expected a drastic cut in salary (from middle-class income to zero salary). I expected a harsh cut in spending (the hardest to swallow was no more long haul flights to visit families and friends). People in HK and the UK would ask us when we would visit. Not wanting to give away our financial situation, I would smile politely and say, 'Not too long I hope.' Deep inside of me though, all I could imagine was us living a very basic and quiet life in a very remote part of the world with no spare cash to travel. I expected a content but much humbler way of living. - I was invited to speak at a world-famous investment bank with live-listening-in from abroad. These bankers have stock market TV running in the lifts because they cannot bear to leave their business for a minute and yet they stopped for an hour to find out about New Sight! - I spoke at the prestigious Royal Geographical Society whose past speakers were legendary astronauts, polar explorers, and conservationists like Dame Jane Goddall. I still cannot get over the fact that people would PAY to hear me speak! - In India, we presented at an International Eye Health conference held every 4 years attended by over 1600 delegates from 84 countries and inaugurated by India’s immediate past president Dr. Kalem. - We wiped our emergency fund (supposed for family emergencies) to get to India and leave our children with our babysitters (my parents) in Hong Kong. A month later, a lady whom we have met only once transferred the exact amount of our airfares into our bank account! - We had a stop-over in Malaysia and so we took the advantage of spending two days there as we have never been there before. You guessed it, we did not ask but someone whom we barely knew, paid for our hotel! Whilst I was marvelling at all these unexpected turn of events, we received news that against all odds, we had won the international eXcellence in Ophthalmology Vision Award! Henri had to stay in Congo because of the patients. I really didn’t want to leave our kids. Still, for a training grant of 50,000 Euroes for New Sight, who wouldn’t make an all-expenses paid trip to Prague for the Award Ceremony - another glitzy event for over 1000 ophthalmologists from all around the world? So in October 2012, I set off on yet another unexpected trip. I was overwhelmed by surprise upon surprise. First, they flew me Business class. Then I arrived at the hotels and realised that they were 5-star hotels. I was taken to my luxurious room on the Executive Floor where there was beautiful free food and drink all day! I even had a maid who would come in every evening to turn my bed out! I thought to myself, ‘This is all unbelievably lovely. While I appreciate their kindness and generosity, I can't help but think if only I had been flown in Economy class and been put in a less expensive room, thousands of dollars / pounds could have gone to New Sight instead!’ This jet-setting 5-star business-class high-profile life was not the life I expected! I never once asked, hoped, imagined or prepared for anything like it! Just look at me, I didn’t even have the right clothes or shoes! When I went to Congo, it had never crossed my mind to put black-tie attire for a Czech palace on my packing list! Over the phone, Henri kept saying that I should just enjoy it. ‘I think that God is trying to tell you something.’ he said, laughing. I found out what that something was on my way back from Prague to Congo. 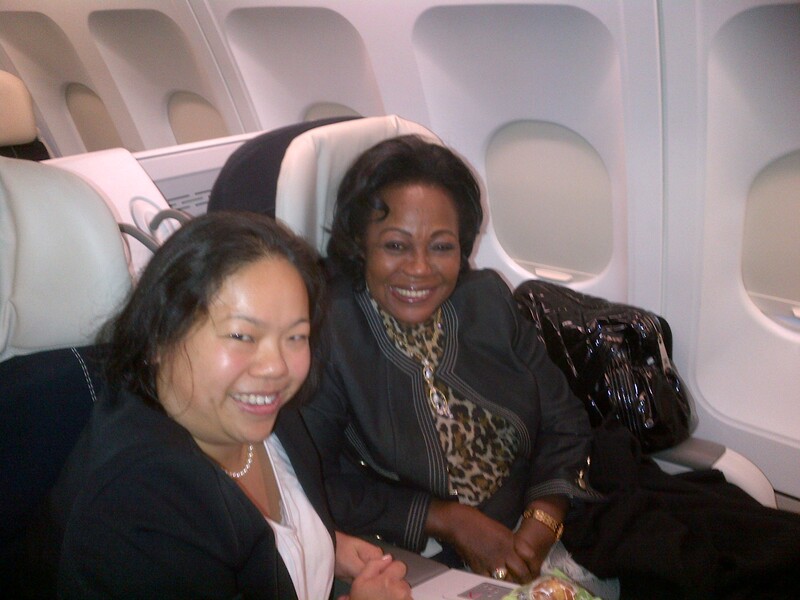 My business class ticket sat me next to the wife of the President of Congo for 8 whole hours! I had come to Congo to sit next to the poor, and God had me sitting next to the First Lady of the country! She gave me the mobile number of her personal assistant and arranged for me to meet her team a few days later to discuss how they could help our work! I like to plan. I love to plan. Okay, I am addicted to planning! These months have taught me that I actually have no idea what God has planned for us. I know though that God has planned something good, something that no eye has seen, that no ear has heard, that no mind can conceive (1 Corinthians 2:9) And best of all, He has promised to be with me all the way.